Is the Bible a Reliable Source of History? 1) We know with surprising accuracy what the books of the Bible originally said. It amazes me that I still hear people claiming “the Bible has been retranslated and rewritten so many times, we can’t really know what it originally said.” The example of a game of “telephone” is given, as if the Bible was translated from Greek to Latin to German to French to English in a series of translations that each may have substantially altered the meaning. Those who make this argument reveal their ignorance. The truth is that all of our newest translations, and the vast majority of translations throughout history, have been translated directly from manuscripts in the original language. For the Old Testament, this is predominantly Hebrew with some sections of Aramaic. 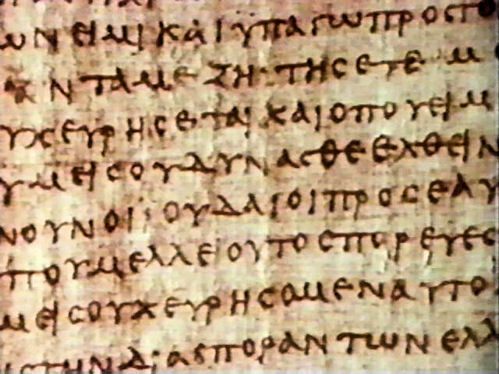 For the New Testament, this is Koine Greek. In fact, our manuscript attestation for the New Testament is far better than that of any other work of antiquity. Here is a table to illustrate. To throw out the Bible and remain consistent we must throw out… every historian and piece of literature in antiquity. If you have been using this argument against the Bible, please reconsider. If you hear this argument being used, please kindly correct the confused cynic. 2) The Bible is consistent and historically accurate. There are countless examples given of alleged inconsistencies or inaccuracies in the Bible. To address them all would be impossible. Rather I will give several examples in order to illustrate various principles to bear in mind when considering these allegations. Many supposed inconsistencies that were once concerning have been debunked by emerging historical knowledge. Take for example the discrepancy between Daniel 1:1, which states that Nebuchadnezzar became king of Babylon in the 3rd year of Jehoiakim king of Judah, and Jeremiah 25:1, that states that it was the 4th year. Much was made of this problem until scholar R. Thiele highlighted two different systems for counting reigns in the Ancient Near East: (a) the accession year system and (b) the non-accession year system. Jeremiah counts the accession year, Daniel doesn’t. Take for another example the existence of the Hittites. Though mentioned more than 50 times in the Bible, there was no archaeological evidence of their civilization until a series of discoveries beginning in 1876. Until that time, their inclusion in the Biblical narrative was used as proof of the fabrication of much of the historical narrative of the Israelites. We now know that the Hittites were a prominent Near Eastern civilization in the 15th and 16th centuries B.C. Those purporting these kinds of inaccuracies ought at least have the courtesy to admit that we don’t always know enough to authoritatively invalidate the text. Many claims about inconsistencies are the result of narrow minded thinking. Googling “Inconsistencies in the Bible” reveals embarrassing results. These lists are comprised by people who have no desire to actually understand what the Bible is saying or use simple logic to reconcile passages. Matthew 27:5 says that after betraying Jesus, Judas hanged himself. Acts 1:18 says that he fell headlong, his middle burst open and his entrails gushed out. Under what kind of circumstances does someone’s middle burst open and entrails gush out? Randomly? Or after they hang themselves and decay? In Matthew 26:8 the disciples reproach her. In Mark 14:4 “some” reproach her. In John 12:4-5 Judas Iscariot reproaches her. If the disciples reproached her, was that not “some” of those present, and was Judas not among them? Perhaps Judas was the most vehement and thus received a highlight in John’s account. What would be concerning is if all of the gospel accounts matched word for word. The fact that they describes such events with details that don’t contradict but do highlight different aspects lends credence to their individual, non-collaborated work. Many claims about inconsistencies are a result of incomplete Bible knowledge. In Luke 22:17 Jesus supposedly gives the Lord’s supper in the opposite order (wine, then bread) of the other accounts, but if simply read until verse 20 we see that He didn’t actually pass the cup around until after the meal. In Luke 12:4 Jesus says not to fear men. In several passages he hides, escapes, or goes away secretly. But is it not revealed in scripture that rather than being afraid of what is going to happen to Him, Jesus knows that He must wait until the appropriate time to face His execution boldly? I’d also like to point out as a general principle that some inaccuracies are purported because no other work of ancient history validates what the Bible is saying by restating it. But do we require other ancient histories to be repeated in other places in order to be validated? If the content of the Bible were not so emotionally charged, I doubt its historical value would be questioned so adamantly. The massive lists of “inconsistencies” in the Bible are the result of narrow mindedness and lack of basic knowledge about ancient historiography and Biblical teaching.